I was just reading this week's "Approval Matrix" on New York Magazine's website when I saw a mention of Novak Djokovic's gluten free diet. The Approval Matrix called it "Highbrow" but slightly "Despicable" that many articles about Djokovic are "obsessed" with the tennis star's gluten free diet. 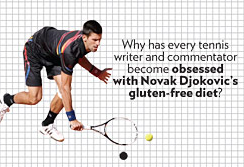 I then went over to Wall Street Journal and found an article summarizing the reason for this supposed obsession: Djokovic swore off gluten within the last year and has had a terrific season. Perhaps giving up gluten and his stellar season are related? I was walking on West 3rd Street with my parents today after a great Mother's Day Breakfast at The Little Next Door when I saw the sign pictured below at D'Amore's Pizza. 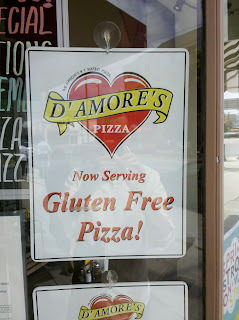 I haven't tried this out yet -- has anybody been? Leave a comment below! 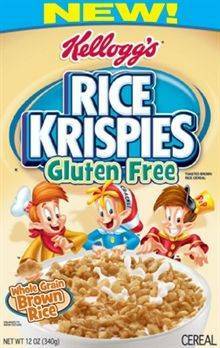 Well you've probably heard the rumors and they are definitely true -- Kellogg's is coming out with a line of gluten free Rice Krispies! The cereal, made with brown rice, is a great option for those of us who have been missing Rice Krispies since going gluten free. Kellogg's recently contacted me to try out the cereal and sent me a complimentary package to test the new gluten free Rice Krispies. Even better than just fulfilling a craving is that the Rice Krispies are just as tasty as their regular counterparts! Perhaps the best part: they snap, crackle, and pop just like gluten-filled Rice Krispies. I can't wait to make Rice Krispies treats with these; before having access to these, I would replace the Rice Krispies in the recipe with Fruity Pebbles for a great gluten free treat. My friend Sarah recently sent me a recipe using gluten free Rice Krispies and I can't wait to try it once these gluten free Rice Krispies hit shelves in May/June. With Chex also being on the market with lots of great gluten free options and Post recently debuting a gluten free Fruity Pebbles, Rice Krispies has some competition for consumers who are missing out on their gluten eating days. It's great to see more gluten free cereals on the market -- I'm personally hoping for a gluten free Honey Nut Cheerios! The Kellogg's website says it will have more information soon regarding the availability of Rice Krispies. Keep checking back for more info!